The city of Seattle, Washington, is situated on a narrow strip of land separating the salty Puget Sound from the fresh Lake Washington. There’s also a mountain range on either side, with the Cascades to the east and the Olympics to the west. The result is a mild marine climate rife with natural resources and vegetation. White settlers first reached the Seattle area in 1851, establishing a township called “New York-Alki.” The settlers soon decided that the deep-water harbor beyond Elliott Bay would make a better settlement and officially christened Seattle in what is now the historic Pioneer Square area. The city was named after the Duwamish Indian chief named Sealth who helped the settlers in the city’s earliest days. The city’s economy relied on a lumber mill opened by Henry Yesler in 1853, but the town had ambitions beyond that. When the territorial legislature officially incorporated Seattle in 1869, it had more than 2,000 residents. The 1870’s were a relatively quiet time for Seattle despite several developments that would ultimately shape its history. First, coal was discovered near Lake Washington, giving the area another natural resource to sell. Second, the town convinced the Northern Pacific Railway to connect the town to its rail lines in 1883, allowing the city to grow beyond anyone’s imagination. Coal and lumber remained the city’s primary industries in this period, but wholesale trade, fishin g, shipping, and shipbuilding also became bulwarks of the local economy. The good times were suddenly halted on June 6, 1889, when a massive fire knocked out 116 acres in the heart of the city’s business district. Amazingly, nobody died in the blaze. However, it caused millions of dollars in property damages. Even this turned out to be a blessing in disguise, as municipal leaders took the opportunity to redesign the city from the ground up. The streets were widened and regraded, making them more suitable for modern transportation. A municipal water system was developed, and a professional fire department was established to prevent another blaze from engulfing the entire city. The new buildings were constructed of brick or stone that was less flammable than the wood previously used, and residents opted for bold stylistic choices that gave the city a unique look. The 1890’s added another transcontinental railroad to the area (the Great Northern in 1893), but more important was the discovery of gold in Alaska and the Yukon region of Canada in 1897. Seattle had established trade routes with both areas, making it the obvious place for prospectors to stock up on everything they needed to pursue riches in the northern wilderness. Some in the city even came to view Alaska as the city’s property the two were so closely intertwined. The early 1900’s saw Seattle add two more transcontinental railroads (Union Pacific and Milwaukee Road), making it one of the most accessible areas in the American West. This solidified the city’s status as an epicenter for trade, especially with Asia and the North Pacific. This prosperity allowed for a population explosion, as immigrants came from around the globe seeking work. Scandinavians came for the prosperous fishing and lumbering industries, while African Americans were employed as waiters and railroad porters. Filipinos, Japanese, Chinese, Jews, and Italians also established robust communities in Seattle around this time, creating the International District still in place today. With a population of 240,000 and growing, Seattle sponsored an international fair in 1909 with numerous notable exhibitions. One of the most important was the Alaska-Yukon-Pacific Exposition that called attention to Seattle’s vital role in the economic and cultural development of what is now called the North Pacific Rim. The L.C. Smith building was completed in 1914, remaining the American West’s tallest human-made structure for over four decades at 42 stories tall. It soon became a symbol for Seattle’s metropolitan aspirations. World War I represented another boom period for Seattle, as the city’s shipyards were responsible for a full 20 percent of total American wartime tonnage. A worker’s strike in 1919 earned national attention as a result, especially once it turned into the longest general strike in American history from February 6-10. The strikers were poorly organized and had no obvious goal, but it still earned the city a reputation for radical political ideas. The Great Depression hit Seattle especially hard, with a “Hooverville” sheltering 1,000+ unemployed men springing up in an abandoned shipyard near Pioneer Square. The economy didn’t recover until World War II brought all of the shipyards back to life. The war also allowed a modestly successful aircraft manufacturer called Boeing to become a force in its industry, increasing its workforce by 1,200 percent and its sales from $10 million to $600 million annually. The end of the war marked another economic downturn that would persist until the mid-1950’s. 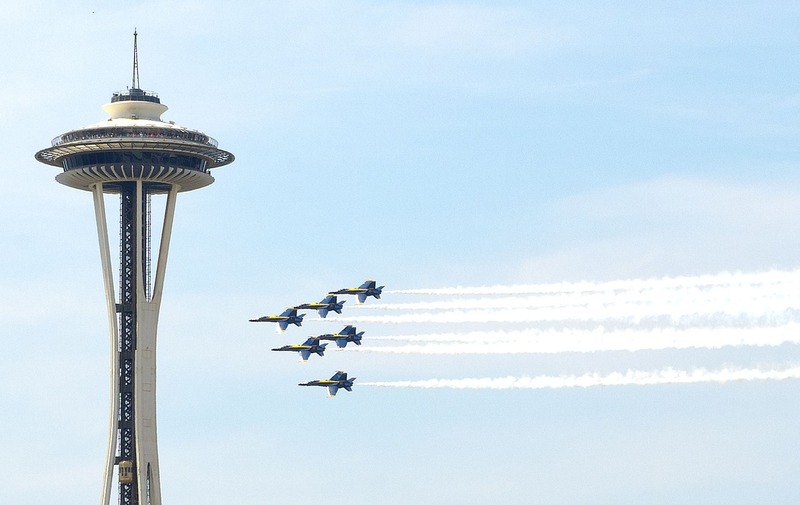 Boeing’s introduction of the 707 passenger jet put the city back on the map. The city sponsored a world’s fair in 1962, categorized by the construction of the Monorail, Space Needle, Pacific Science Center, and Seattle Center that remain landmarks to this day. Today, Seattle has a more diverse economy than ever before. Weyerhaeuser and Boeing remain some of the area’s largest employers, but other firms such as Microsoft have also set up shop. Senators Henry Jackson and Warren G. Magnuson used their substantial political clout to secure federal research and defense funding, providing an additional avenue of growth. The city of Seattle has always been optimistic and entrepreneurial; an attitude sometimes described as the “Seattle Spirit.” This attitude has produced many achievements since the 1970’s, including the construction of a canal to connect Lake Washington and the Puget Sound and the “Forward Thrust” program responsible for the Kingdome and numerous parks in and around the city. 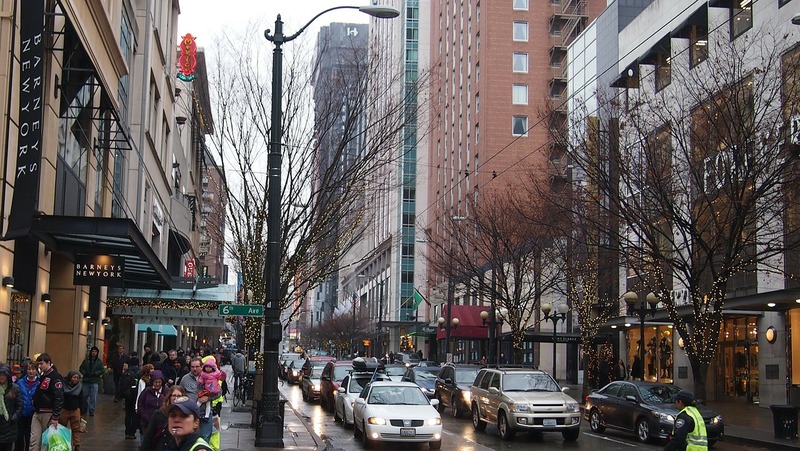 The city of Seattle may best be described as a paradox. It wants to grow exponentially without compromising the surrounding area’s natural beauty. It is a city defined by its homes that nevertheless has a substantial homeless population. It is a hotbed for radical politics that isn’t as radical as most believe. In short, it is Seattle, Washington. Steve from FurnaceUSA Seattle HVAC contractors is proud to have wrote this article about the history of Seattle.